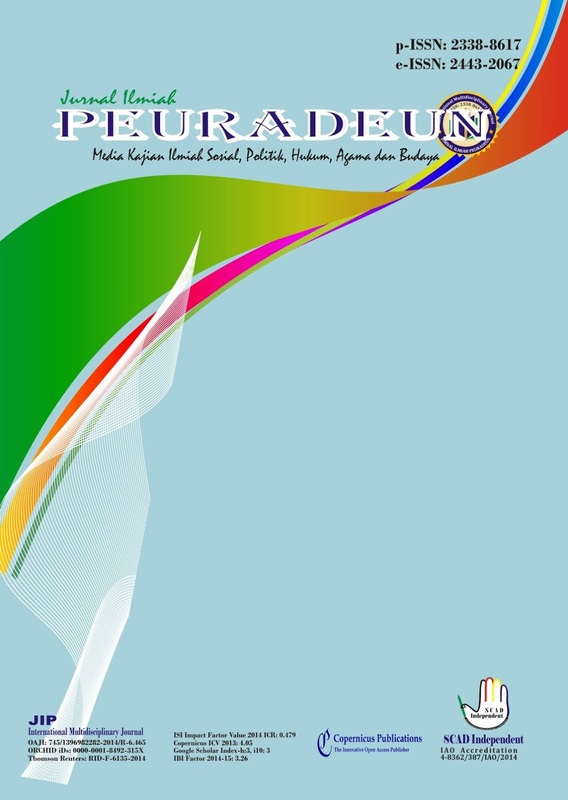 Jurnal Ilmiah Peuradeun (JIP) is a multidisciplinary peer-reviewed journal with a very wide-ranging coverage, consolidates fundamental and applied research activities, with the issue of Social Sciences, Natural Science, Education, Politics, Law, Religion, Culture and Public Policies. This journal provides immediate open access to its content on the principle that making research freely available to the public supports a greater global exchange of knowledge. JIP as an Open Access journal is licensed under a Creative Commons 4.0 International License (CC-BY-NC-ND) and Department of Labor United States of America, Copyright completely under SCAD Independent. JIP. Ed. 1 (2016), 1-14. The paper studies the Islamic viewpoint about the environment. Environment holds a central position in most of the discussions of development strategies in the contemporary globalizes world. This is why that deteriorating environment is adversely affecting human lives and is a potential danger for future generations. Today, the environmental crisis endangers human being, other living organism and the natural world alike. How should human behave towards the natural environment is remained most important. Technological solution has not been resulting in satisfying outcome. Discussing the role of the Islamic principles of unity, trustee and responsibility, the Quranic teachings may enhance the environmental consciousness among the people which enable them to establish friendly relationship between God, humankind and nature. In this respect, this paper is a humble attempt to understand the Islamic approach to the environment to explore various conceptual dimensions of environmental security and the possible role of Islam in protecting the environment for the broader benefit of humanity. This paper will also discuss the Islamic principles of human behavior to deal with the nature and environment. JIP. Ed. 1 (2016), 15-26. The implementation of Islamic law in Aceh is included education by organizing Islamic curriculum in each level of education. How is the implementation of the curriculum in a multi-religious society like Banda Aceh? Banda Aceh has implemented a model of Islamic education through Diniyyah which has been implemented in all public schools in Banda Aceh since 2011, started with elementary, junior and senior high school. The results showed that the implementation of Islamic curriculum in Banda Aceh through diniyyah been operating effectively and do not make the non-Muslim communities disrupted. The implementation of Islamic education through Diniyyah did not clash with the main curriculum because it was implemented in the afternoon. So, this should be one of the models of Islamic curriculum implementation in Indonesia, particularly in areas which Muslim is majority without denying the existence of minorities. JIP. Ed. 1 (2016), 27-38. The current study addressed the current circumstances and challenging issues for the Mongolian migrants. We involved in the survey citizens who have been lived and worked in the Republic of South Korea and Japan. According to the results of the survey, working of Mongolian citizens in hazardous and insecure working conditions reveals the weak coherence between regulation and policies towards to the immigration and professional organizations. We concluded that one of the priorities in the area should be developing a sound policy on migrant labor force that meets international labor standard with considering of economic, social policies and then in the implementation process establishing centralized database is crucial. JIP. Ed. 1 (2016), 39-52. All European societies are ethnically and culturally plural. Historically, the most significant source of cultural (not necessarily synonymous with ethnic) diversity in European nation-states has been regional, often a result of conjoining economically, socially, culturally, linguistically - and indeed ethnically - disparate places into single polities, and (certainly in Northern and Western Europe) engaging them in what the French call nationalization. This paper discusses the relationship between cultural diversity in Europe, and that international movement described as “transnational” (transmigration). Though not as new or as homogeneous as some have proposed, transmigration will grow in importance in the 21st century. Groups or individuals may return to places of origin or “assimilate” into receiving societies, but without resort to unacceptable levels of control of the movement of people, goods and ideas, transmigration will be a prominent structural feature of European societies for the foreseeable future: do we really wish to monitor every exchange between receiving and sending societies? In any case, modern systems of communication (e.g. the Internet), and the cheapness and rapidity of mass international travel make such surveillance difficult, even impossible in a transnational, globalizes world. JIP. Ed. 1 (2016), 53-64. This research aimed to determine the local wisdom of the community of Lembah Seulawah Sub-district, Aceh Besar, Indonesia of controlling insect pests in vegetable plants. In addition, the study intended to examine the impact of using paper as a mechanical trap for insect pests in vegetable plants. Both qualitative and quantitative methods were used in this research. The qualitative data were obtained through interviews with farmers, whereas the quantitative data were collected from an experiment. Thirty randomly-selected respondents were interviewed and then the qualitative and quantitative data processing was performed. The results showed that they still use plant-based materials as insecticides which constitute the local wisdom of controlling insect pests in vegetable plants. The plants used as insecticides were, among others, garlic (Allium satifum), castor bean seeds (Ricinus communis), lemongrass, neem seeds, and thorny amaranth as the trap plants. JIP. Ed. 1 (2016), 65-76. This study aims to determine the process and counseling services performed by guidance and counseling (BK) teachers in coaching the students’ character, with the method descriptive qualitative approach. Guidance and counseling are services of assistance given to students to develop their potential, alleviate the problems, and shape the character of the students in accordance with the norms that exist in the neighborhood. The character building of students can be done through guidance and counseling services that are prevention, alleviation and development. The results showed that the process of guidance and counseling was done not in accordance with established procedures and the implementation of observation and data identification to understand the needs within the framework of the preparation of BK program. Besides, the prevention activities were carried out by providing knowledge about the character of the students through information services, content mastery and group counseling as well as involving students in religious activities at school. JIP. Ed. 1 (2016), 77-88. This paper examined the reduplication of Pak–Pak Boang language which consists of many reduplication, the speakers of the language are situated in the Rundeng, Subulussalam, Aceh Province. The research aspects to explore are types of reduplication and the forms produced through the reduplication of the language. The purpose of this paper is to describe the types and forms of Pak-Pak Boang language. The method applied in this research was qualitative descriptive, where the data gained through recording, documentary study, and introspection. The result of the findings showed that Pak-Pak Boang language reduplication consisted of four types: Phonology, syntaxes, semantics, and morphology reduplication. The second finding revealed that the reduplication forms were Dwilingga, Dwipurwa, Dwiwasana, and trilingga reduplication, while the process to form reduplication consisted of seven ways: Adjective, Verb, noun, Pronoun, Adverb, Interrogative, and Number reduplication. JIP. Ed. 1 (2016), 89-102. This article begins with explaining the present problems of Acehnese cultural identity, then articulating how the art is usefully employed to solve those difficulties. Relying on post-colonial theories, I formulate the framework that Acehnese art has significant position to handling current cultural problem of Acehnese society. This work offers a cultural resolution of Acehnese present conflict between traditionalist and modernist Muslims, which are represented by Dayah and Muhammadiyah community in Aceh. It is commonly known that Islam is the pride of the Acehnese. To date, there is, however, no certainty about the nature of Islam in Aceh, as heated debate still exists between traditionalist and modernist Muslims upon the nature of Sharia application in the place. This dispute has generated different extreme perspectives upon seeing themselves in the way to treat their cultural identity. Here we establishes that Acehnese art plays great role in bringing togetherness to different groups of Acehnese society, which results in resolving horizontal conflict of Acehnese society. It shows that Acehnese art accommodates to all of different ness of Acehnese communities and, therefore, raises Acehnese collective consciousness. JIP. Ed. 1 (2016), 103-114. JIP. Ed. 1 (2016), 115-126.